A magnetic sweeper is certainly a welcome addition to any home or workplace because of how easy it makes cleaning up large messes. The construction of this magnetic sweeper ensures a long service life in whatever settings the sweeper is used, with an extremely durable steel and aluminum construction which offers an excellent blend of both toughness and maneuverability. The 7” rubber coated wheels also provide great grip on most surfaces and are also suitable for delicate surfaces that can be easily damaged. Magnetic sweepers also excel at recovering lost items in places such as grass, dirt, or carpet is made easy, with the powerful permanent magnets able to pick up both large and small items. While magnetic sweepers are terrific at picking up loose nails or other objects in a driveway that can puncture tires or injure people who step on them, other added benefits of using a magnetic nail sweeper is for picking up potentially dangerous objects, such as loose blades, cut pieces of sheet metal or sharp metal shavings. 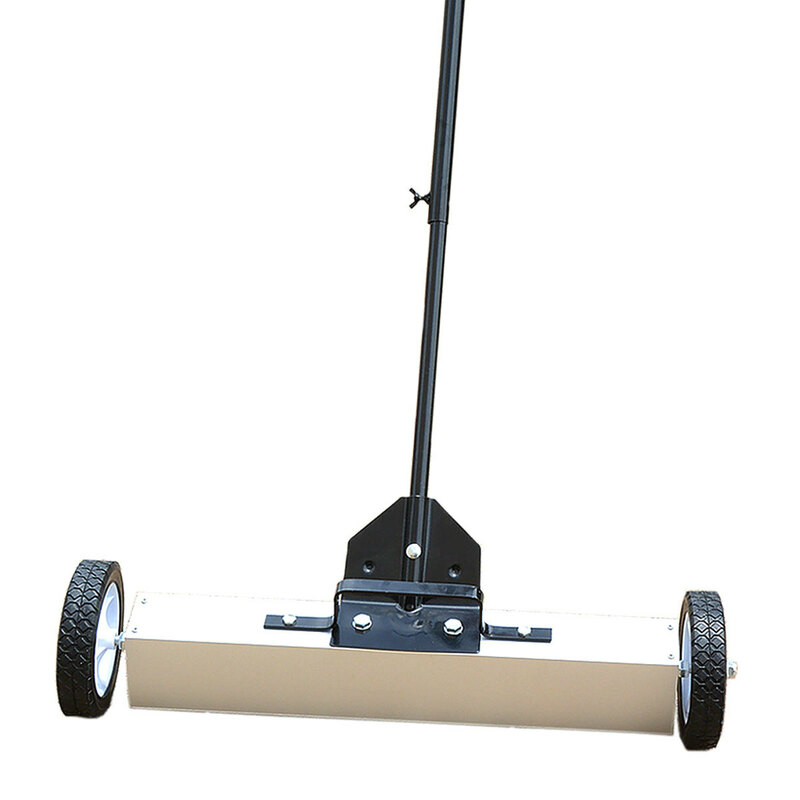 Our 24” wide Magnetic Sweeper is made with permanent ceramic magnets to pick up nails and scrap metal. Perhaps you are a business owner and do not want clients to come back to their car on your parking lot to a flat tire pull out the Magnetic Sweeper. Maybe you need to protect your vehicle’s tires and the guys have been breaking up pallets in the back. This magnetic sweeper will take care of that too. Your magnet sweeper’s magnets are enclosed in a heavy duty outer casing for their protection. Your Heavy Duty Magnetic Sweeper easily Picks Up Unwanted Metal Materials Off Floors And Surfaces For Safety. You can use your magnetic sweepers in the garage or use your magnetic sweeper in the shop, you can even use your magnetic sweepers in the grass with its oversized wheels after a roofing job to keep little ones feet from puncture wounds. 24" by 3" pickup surface area for a total coverage of 72" square inches means that cleaning up large areas couldn't be easier. Adjustable Deck Height: With a ground clearance range of 1"-2", picking up large or irregularly shaped objects becomes easier than ever. Quick Release Lever: Once you've swept an area for debris and other metal objects, releasing everything is made simple by just pulling on the convenient release handle on the top of the sweeper to instantly dislodge picked up objects. Quality Construction: Featuring a rugged aluminum and steel construction, this magnetic sweeper is light yet durable. For added convenience, this magnetic sweeper features a telescoping handle that allows for an added degree of usability. Magnetic street sweepers use magnets to pick up debris off streets, parking lots and highways. Magnetic sweepers are used in storage areas where there is a high volume of traffic. They are used in warehouses and can be used on the ground that can't be cleaned with broom equipment. We break up pallets in the back and our trucks are back there too. No more flat tires from pallet nails.